What do to do when my Checkpoint System alarms? It is important to convey to the customer that this is an INVENTORY CONTROL SYSTEM not the shoplifter, bad guy, criminal system. Have you purchased something in another store with a system like this? Other retailers may not have properly deactivated a label they placed on merchandise. Are you returning an item for exchange or refund? Was the item they are returning, purchased or stolen? Is there any reason you can think of for our inventory system to alarm? Let the customer offer input as to why the system is alarming. They may become nervous and give you more information. In some cases shoplifters will enter a store intentionally with a live tag or label to set your system off. They may say something like “oh, this happens to me all the time”. That way when they leave and set the Checkpoint System off you will simply allow them to go. Use this as a customer service opportunity to “fix” the customers problem. A real customer will be appreciative. A great way to approach the customer is to say “let me take care of that for you”. In many cases the alarm could be as a result of the cashier not removing a hard tag or deactivating a label. So approach them to provide customer service: approach customer in friendly manner and ask to check their receipt. You can imply there may have been an error and an item may not have been deactivated. Implying the customer has done something can escalate the situation. If the customer is not stealing, this is another form a good and attentive customer service. Take the customers bag and walk it through the Checkpoint System yourself. You know you do not have a tag or label on yourself. If it alarms then chances are the item is in the bag. The best way to resolve this is to ask for the receipt and take the merchandise to a cash/wrap and look for the item that is causing an alarm. Check the merchandise against the receipt. Shoplifters will sometimes drop a concealed item they had on their person into the bag after they leave the cash/wrap. If the bag does not alarm then ask the customer to walk back through the system including any purses, coats… they are carrying. If it alarms then the customer has a tag or label on their person. 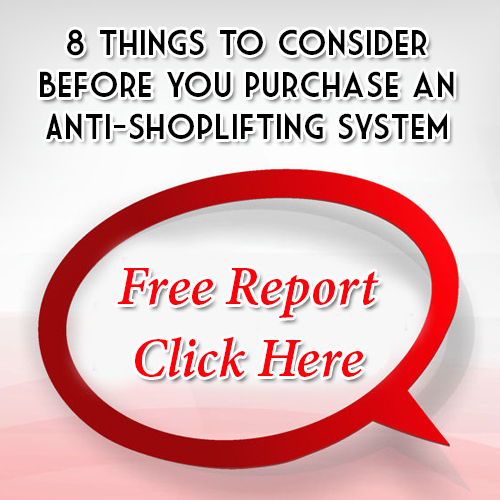 Follow your stores procedures for a potential shoplifter. Checkpoint Systems are proven commercial equipment that many State Laws acknowledge. It is perfectly safe as harmless as an FM radio. It will not affect or impair watches, magnetic tapes, cameras, hearing aids, pace makers, cell phones, access control cards or any other similar device. In some cases shoplifters will become agitated and argumentative. Remember you have the legal and moral high ground. Stay calm and continue to use your skills to resolve the issue. If you are in doubt ask for assistance from your store staff.